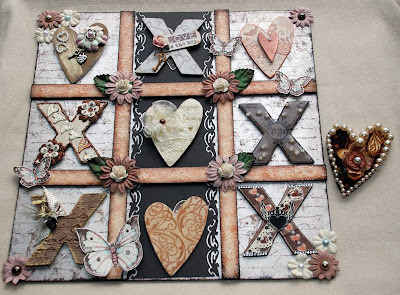 Tando Creative Ltd are running a competition to win this fabulous decorated Hugs and Kisses Board. 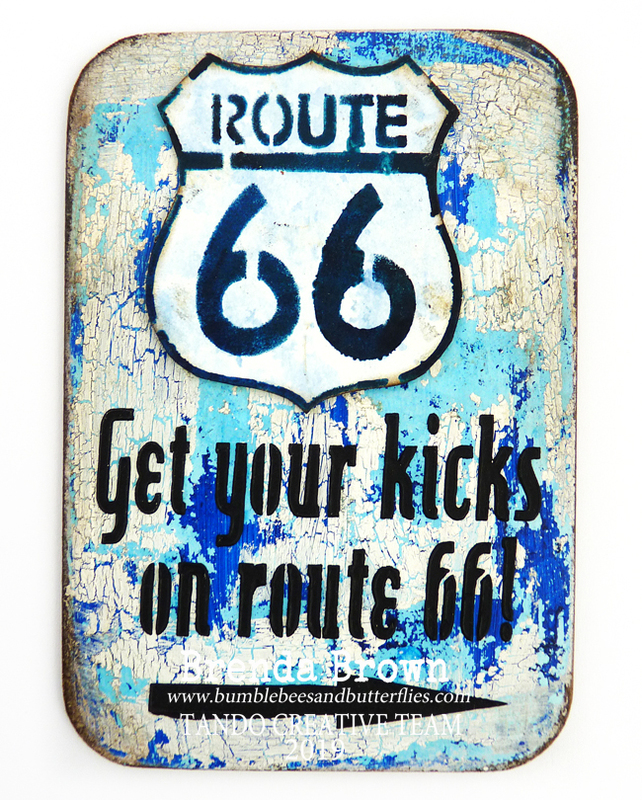 This board is unique as it is a larger version of the one available to buy and has been specially made just for this competition. 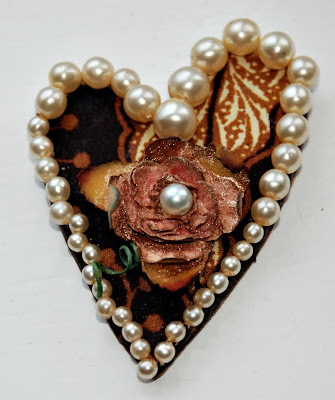 It includes a chipboard base and 10 completely individual chipboard pieces that have been beautifully decorated by ladies from all round the country. The pieces have all been signed on the back by the artist. The competition is open until Sunday 14th February when a winner will be picked at random to win this prize. 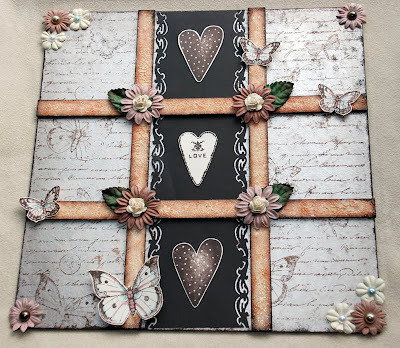 To enter the competition all you need to do is make make any project, whether it be a card, altered art, scrapbook page etc using a piece/pieces of Tando Creative chipboard. The project must be made for the competition so not shown previously on blogs or galleries. Just leave a comment on this post with a link to your entry. 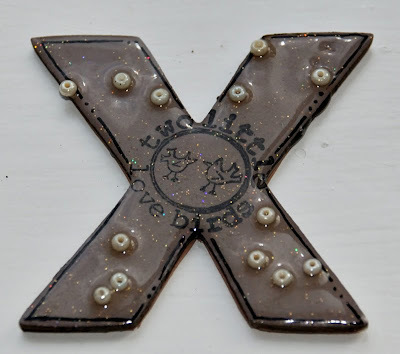 I've added a Mr. Linky widget....erm, never used one before so I hope it works...!! Its Karen here and I have been working with the small cat. 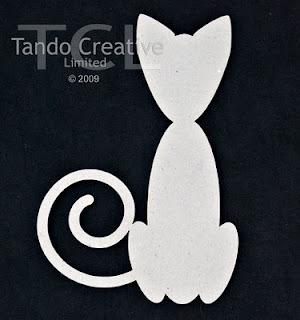 Awe its really cute with a lovely curly tail! I have been sat on this one for a while (not literally haha) trying to decide what to do with him...yes, I decided it was a him haha! I have incorporated him into the cover of a book. The book was from my own stash and I have stuck bits all over it before painting to give it lots of texture. The cat was then painted in black acrylic and I painted glossy accents over as I didn't want him too smooth. Its been tied together with a fairly wide satin ribbon. I really like how this cat stands out. This book is just for me for a change haha. Hi, it's Sharon here. 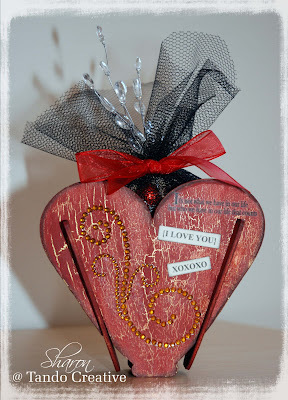 I have had great fun decorating a lovely little chipboard Heart Basket. 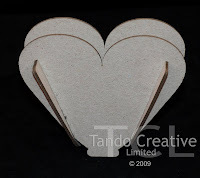 It is supplied flat but easily slots together and stands up, perfect for small gifts. The heart size is approx. 120mm wide by 110mm tall and 25mm deep. I decided to go for a "worn wood" effect. 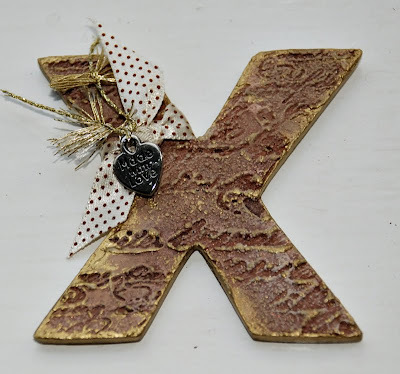 To do this I first painted it with Reeves gold acrylic paint then applied a layer of Blonde Moments crackle glaze. I left it to dry completely overnight and then applied the top layer of paint which is deco art deep red. The edges were inked with charcoal chalk ink. 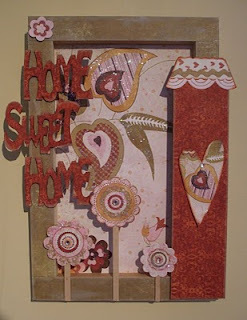 To decorate the front I used a self adhesive crystal swirl made by Zva Creative, words cut from paper by Teresa Collins and a Delish designs rub on. I have filled it with sweets inside black tulle and added a red chiffon ribbon bow and crystal stems. As an extra surprise I will add a cimema gift card or similar behind the sweets. Once it has been opened I of course plan on reusing the crystal stems and tulle LOL but will also fill it with love quote tags and use as a display. 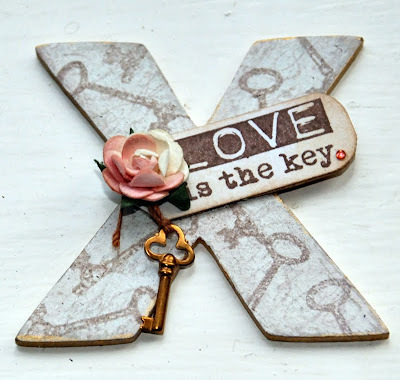 Hello, its Karen here with another piece from the LOVE & STUFF range. 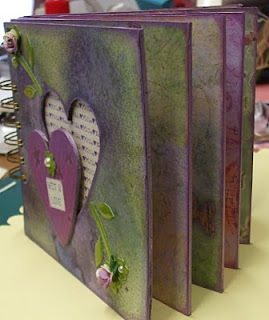 This time I have been playing with the really georgeous & versatile HEART/FLOWER MINI BOOK. 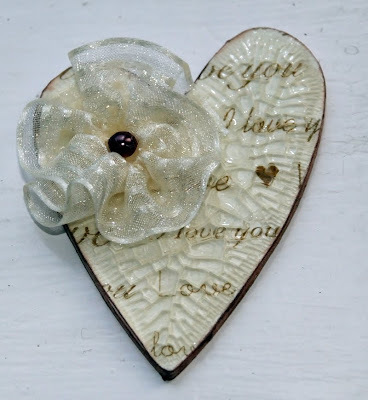 It has a laser cut cover with removable heart shape and floral engraving. 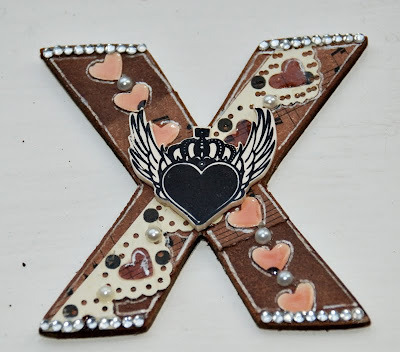 There are 5 additional chippie pages to decorate as well. This book hasn't been punched with any holes to make it even more versatile!!! 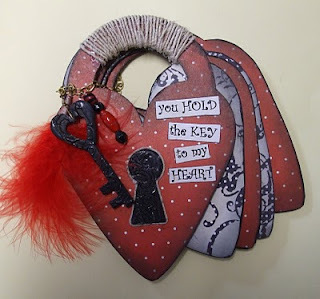 I can think of so many ideas for this book, not just Valentines. In fact I have made this up as a present for my Mum. its going to be filled with lovely pics of her Grandaughters, Vikki & Millie. I have used the 6x6 inch book but it also comes in a 4x4inch too. I love that the heart comes out to be attached elsewhere if you want. The first thing I did was to trace the flowers & stalks off so that I had a pattern to replace them with card. I also took the heart out & covered that in a matching paper. 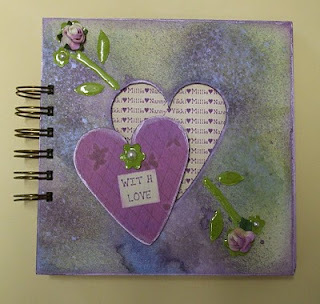 The paper that I used to cover the covers I made up myself using a mix of distress inks & glimmer mists. I am not sure if the sheen shows in the pic but I was really pleased with the results. I edged everything with purple Brilliance Ink. The piece behind the heart apperture is computer generated. I stuck my card flowers & stems in the original positions marked & covered with glossy accents, attaching paper roses & pearly gems as I went. The covered heart was stuck back on at an angle. The inside pages are covered with matching papers from K&Co. 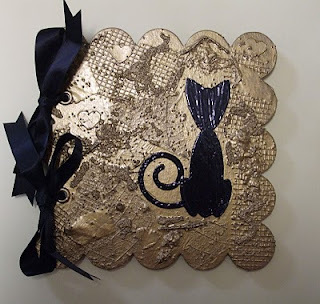 The whole thing has been bound using my Bind It All but you could just as easily use rings or ribbon. Hello, did you all know that its just under 5weeks till Valentines Day??? 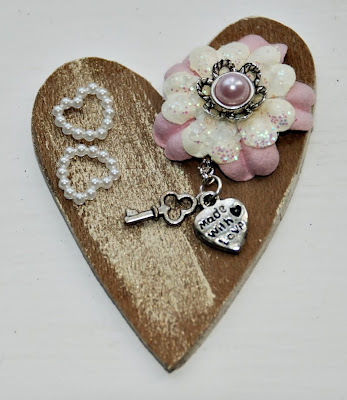 Time for us crafters to be getting on with all things soppy for our other halves I think hehe! Di sent me this lovely book to play with. 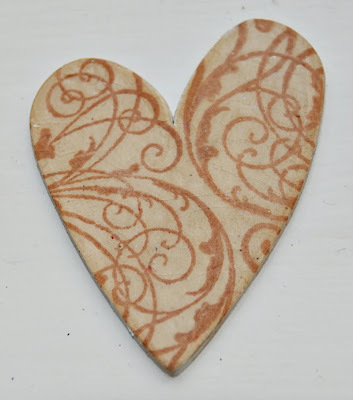 Its a really good size...the heart itself is 5x41/2inches! Plenty of room for photo's & journalling. This little book is such a pretty shape that I sooo wanted to make it very girly but as its for hubby I think he might have raised an eyebrow or two haha. So I have butched it up with red, black & beige. I have yet to add the journalling as its a bit private so I am sure I will be forgiven. I alternated the pages between red polka dot & beige swirly papers. Then I added some black soot distress ink around the edges to make it more masculine, adding black brilliane ink at the very edges. The keyhole (which lifts out...brilliant) I painted black then utee'd. While it was still hot I stamped into it. I did the same with one of the keys (you get two in the pack but I only used one). It still looked a bit bare so I wrapped string around the 'handle' and carefully around the attached lock. I added a red feather & some beads to a brass chain from my stash to keep it all together. 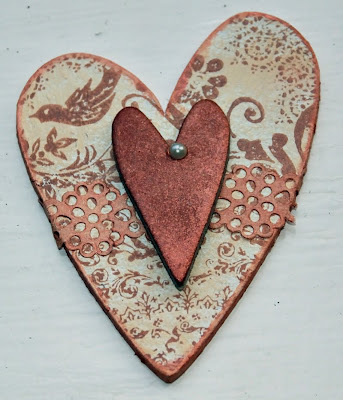 With all this snow that is around it is hard to think of anything other than wintery things however Valentine's Day is just around the corner and if you want to start creating something special for someone special then what better time than now when it is so cold outside. 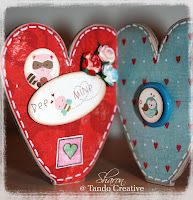 I pondered for quite a while as to the colour scheme I was going to use for this but in the end I decided upon a non conventional Valentine mix of turquoise and red. I have recently bought some of the Bo Bunny Love Bandit and Persuasion papers and decided to use them and chose the colours from them. First of all I covered each heart piece with either Persuasion Love Notes or Whoo Loves You patterned papers, alternating each paper. I also covered the backs of the hearts with the opposite paper from the front. I then sanded and inked the edges with creamy brown chalk ink and doodled inside the edges with a white gel pen to give a stitched effect. 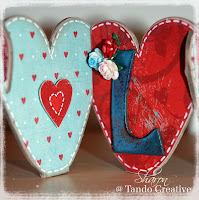 To make the letters I triple embossed them with UTEE using Blonde Moments Angelic Teal and Cosmic Shimmer Tropic Red. To finish each letter I sprinkled a little of the opposite colour of UTEE on to the top layer to give a slightly mottled effect. 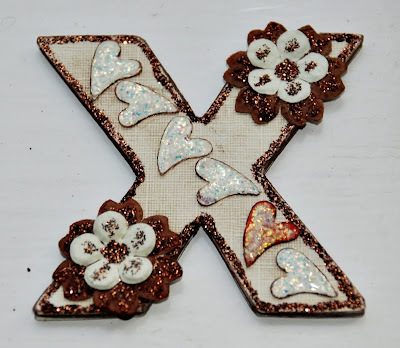 I attached each letter with tacky glue and added some small paper roses. On the back of the wall stand you could put photographs or love quotes to decorate, however I really wanted to use the deer, bird, racoon and owl characters that were on the Love you Deerly paper so I punched some out using an oval punch and inked the edges and added them to every second piece raising them with pop up dots. 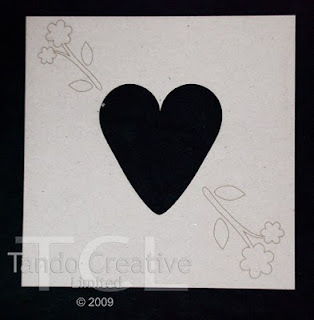 The small hearts were cut from the offcuts of the Love Notes paper. I also punched smaller circles of some of the characters, inked the edges and adhered to a button. They were then put on every alternating heart. Hello , its Karen here with my first piece for 2010! I hope that you are all keeping warm & safe! They are a lovely size to work with and I have recycled a canvas I got in the sales for this (the pic was gross hehe) and used it back to front! I used a pack of Basic Grey Sugared for this project. After I had covered the words & house with paper I didn't like it so I then went over it with chalk ink to make it darker! The swirls on the background have been slightly glittered by puting stickles on my finger & gently dabbing. I did the same with the flowers. 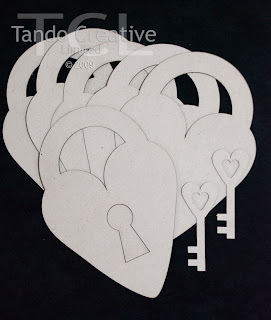 Before I covered the house I traced the heart shape which I cut out & set on foam pads. The roof is DONE using the wiggly card stickers that came with the pack. I stuck plainer paper round the 'frame' and then dabbed at it with a white chalk ink. I left the inside of the frame plain as I thought the pine went well.